As pollinators, bees are responsible for the majority of the food crops we eat and are therefore an integral part of the Earthworks' community. 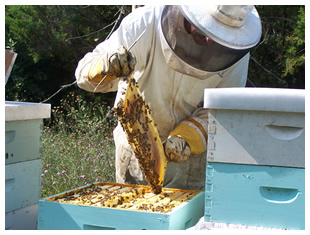 Our apiary promotes biodiversity in our gardens, increased pollination rates, attracts beneficial insects, and also provides an important venue for educating our volunteers and friends about the importance of honeybees in our society. Our honey is considered raw and never expires. It will crystallize if left in a cold area. You can easily de-crystallize your honey by warming it in a hot-water bath or heating it in the microwave (without the metal top).